Please enjoy a wonderful interview with Brendan and Elly Roberts about their new book on finding a spouse. 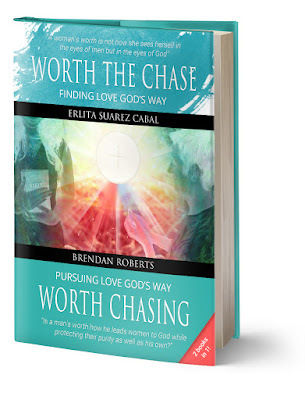 Worth the Chase: Finding Love God's Way has received the following comments: “Refreshing and inspiring,” “life changing,” “part of my healing process,” “deeply moved,” “It made me cry several times and laugh”. This book was written by Catholics who met in an adoration chapel, just 30 minutes after the young lady was begging God for a writing mentor! After writing the book they fell in love. While it was primarily written for singles on relationships with a woman's perspective and man's perspective (two books in one) which focuses on purity, the authors have been surprised that married couples are also enjoying it. It also has heart touching testimonies of broken hearts, a single mom's challenges, a mistress who was led to end her toxic relationship and a woman who was pressured into having an abortion. All share how they came to surrender all to Jesus and return passionately to follow Him. Many singles lose hope on finding the person God has destined for them; they fall prey to the lie that if they feel they are in love then they should give themselves body and soul to the other person. Worth the Chase addresses this, offering great hope that one can become fully pure spiritually especially by seeking Christ's forgiveness through the Sacrament of Reconciliation. Worth the Chase has love letters from God for women and also love letters from God for men which are deeply touching hearts. We are getting feedback of many people crying upon reading these letters. To contact the authors, please write them at worththechase2@gmail.com.